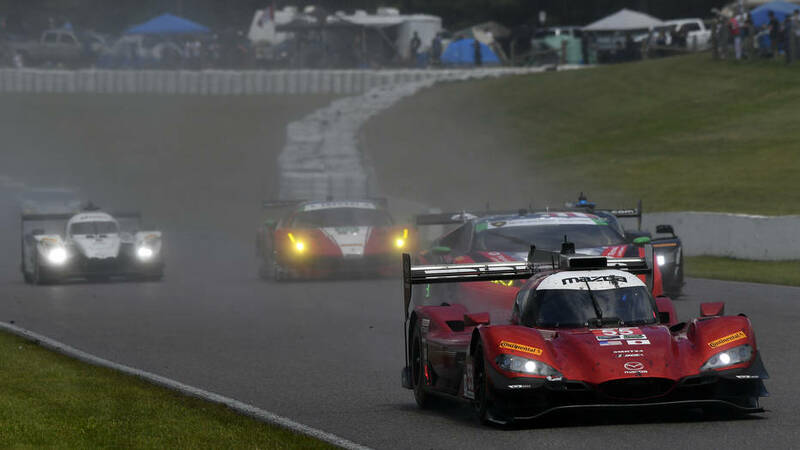 No Fenders -Formula 1, IndyCar and A Whole lot more..: ROLEX 24: Does Qualifying really Matter? And will any of the Pole-sitters be wearing shiny new Rolex time-pieces Sunday afternoon? Was Distractedly putterin' round thou Bungalow by the Sea on thoust Nofendersville Isle Thursday afternoon, and took a quick look-see at Racer.com to find out who'd Qualified where for the 57th Rolex 24 and noticed that they'd just posted the final practice results. Thus for Humour, I goggled' IMSA Radio and chuckled over it saying IMSA Radio Steaming live; Hya! As I tuned-in wonderin' if I'd be able to catch some of the 15mins Qualie' action? and was pleasantly surprised to come Online just before Qualie' began! Although does it really matter in a 24 Hours race? But it was good to once again hear the voice of 'Der Heindenmeir', nee John Hindhaugh, whom I last heard during the Petit Le Mans last October. With his veteran "Expert" Analyst Sidekick Jeremy Shaw alongside, and Johnny Palmer in the Booth. And Nah, that Ain't Dr. Jonathan Palmer, which perhaps is why he goes by Johnny instead; But I Digress... While Shea Adam and Jamie Howe patrolled Pitlane. First up was the 23 strong GT Daytona (GTD) Class contingent, which if I've done my Ryth-Muh-tickin' correctly, is one car shy of the other three IMSA categories combined; Aye Karumba! As one of the IMSA Radio Booth Boyz' correctly noted, pretty sure it was that other Palmer guy, Ci? It was basically like a Drying Track session. As the Pole position lap time dropped frequently as the bevy 'O various GT3 Spec chassis crossed the line. As it was the #13 Via Italia Racing Ferrari 488 GT3 with Brasillian Stock Car champion Marcos Gomez at the controls. As who knows, perhaps the No. 13's lucky after all? Next up, in Thar own 15mins Qualie session was the Gran Torismo Le Mans (GT LM) Class, which features full Factory "Werks" Professional Gun-slingers behind the "Pumped U-P!" GT Cars, with no Silver & Bronze rated Pro-Am GTD Driver restrictions. 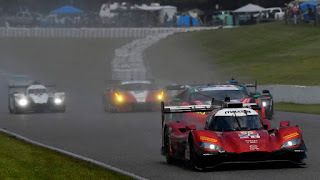 But it seems a bit lame that Thar were only nine competitors running round the massive 3.56-mile Daytona International Speedway race course, leaving me to ponder would IMSA really run a separate 15mins session for the scant four LMP2 runners? Which thankfully they didn't. Whilst Nick Tandy gave the Corvette Boyz' a taste of Thar own medicine, calling "Slingshot On!" Utilizing a double Vette Draft down the Mega' High Banks Straightaway to claim the Pole in the Throwback Brumos No. 59 liveried #911 Porsche. Then the final 15mins Qualie session was for the 15 Prototypes Classes (DPi & LMP2) combined. With All eyes upon the sinister black No. 10 Wayne Taylor Racing Caddy', which didn't feature Fernando Alonso for its qualifying run. As Jordan Taylor, a la the rest of the field will take the Green flag since he qualified the #10, albeit just P6. Yet instead it was the Mazda v Acura Show, as everybody wanted to know if Oliver Jarvis could break P.J. Jones 26yr old track record? As Hindhaugh & Shaw mused how "Ollie," as Hindhaugh called him - Shattered Jones record, ironically in a Mazda Prototype powered by a similar compact sized 2.0-litre "Blown" (turbocharged) Inline four cylinder lump'. Although Toy-Yoters' Beastly inline four cylinder lump was slightly larger at 2.1-litres - And believe it was Hindhaugh who quipped that the Dan Gurney All American Racer's (AAR) Eagle MkIII Toyota "4-banger" was sporting 1200+ Horsepower Wayback in 1993; YIKES! And Shaw mentioned that the track configuration's primarily the same, with the exception of the "Bus Stop" Chicane being slightly altered. As Oliver Jarvis in the Pole winning Mazda and "Move Over" Montoya, nee Juan Pablo in the Acura played Leapfrog over the lead of the race during the first hour's plus 'O action! But who Knows who'll win the race? And who'll win Thar respective categories? Which after all, is exactly why the race is run, Correctomundo! As guess I'd better go see who's leading now, Eh? Have You ever been to Elgin Park?